the winner for the $50 shabby apple giftcard is....Cristin! i put all of the entries from rafflecopter into an excel spreadsheet - there were 103 entries. 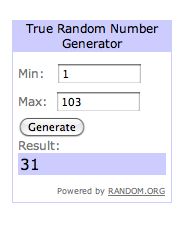 i then used random.org to generate a random number between 1 and 103 and lucky number 31 was cristin.